If you have ever been to the annual Autosport Show in Birmingham you'll be aware that a frequent feature is that various F1 luminaries do question and answer sessions for the gathered fans in attendance. It was while at one such event at this year's show that I overheard the following exchange between two fans in front of me about the luminary in question: 'Who is he?' asked one. 'He's the guy who told his driver to crash' replied the other. It therefore may not be a surprise to you that the identity of the luminary being discussed was Pat Symonds. Reading this month's Motor Sport magazine brought this conversation back, as it features an extensive interview with Symonds. And here, for the first time I can recall, he talks about that crash at Singapore as well as outlines his intention to return to F1 in 2013, adding that he has had offers from 'several' teams. The 'silly season' for who goes where for next year is therefore not only about drivers. For the uninitiated (where have you been?) Symonds was one of the most experienced, skilled and respected engineering heads in the F1 pitlane. He joined the Toleman team in its early throes in 1981 and, aside from a brief spell in 1991, stayed there through its phoenix-like rise to the top of the sport, via the Benetton and Renault incarnations, taking in seven world championships and working with the likes of Ayrton Senna, Michael Schumacher and Fernando Alonso along the way. There also remains a point of dispute on the case that Symonds maintains that it was Nelson Jr himself that came up with the plan initially, contrary to Nelson's contention that it originated from team principal Flavio Briatore and Symonds (the latter is the view that the FIA took). When all was revealed by Piquet almost exactly a year after the 2008 Singapore race (and after Piquet had been fired by the Renault team) Symonds was handed a five-year ban from F1 by the FIA with team principal Flavio Briatore banned indefinitely. Symonds managed to get his ban overturned in the French courts but subsequently agreed a three-year ban with the governing body (with the possibility of working as a consultant in the meantime, as he indeed has been with Marussia). So come this winter he can emerge blinking from the prison gates as it were. And as mentioned it appears there will be plenty of teams waving contracts at him when he does so. There will no doubt be outrage in certain quarters upon his return, but I for one will be glad to see Pat Symonds back in the F1 pit lane. This is for a couple of reasons. First up, I believe that everyone deserves a second chance. I'm not a fan of indefinite punishments, Symonds will by then have 'served his time' and clearly regrets his aberration in what otherwise is an impressive career. So I believe we should let him get on with it. And how many of us can really say we've never done anything that we subsequently regret, on which occasion we did not adhere to our own usual standards? To quote Alexander Pope: 'To err is human...'. But I'll also welcome Symonds back for another reason. I have always taken the view that there has been a gross over-reaction to the whole 'Crashgate' case. No matter who came up with the idea to crash deliberately it was definitely on the wrong side of acceptability and deserved to be punished. But I have nevertheless found the language of the apocalypse in some quarters in reaction to the case, and the severity of the penalties from the governing body, somewhat difficult to understand and rather hysterical. To take an extreme example of the reaction Simon Barnes in The Times declared Crashgate as 'the worst act of cheating in the history of sport' (and many others weren't much milder in their assessment). This is surely excessive: worse than East German mass doping of children in the 1970s? Worse than the ex-husband of ice skater Tonya Harding hiring someone to attack Harding's rival Nancy Kerrigan with a collapsible baton? And if we want a Crashgate analogy from another sport then you only have to look at the recent Olympic games in London. British cyclist Philip Hindes self-admittedly crashed on purpose in a team sprint event in order to assist his team mates. That's about as close an analogy to Crashgate as you'll ever be likely to find, and yet no one was punished for it and nothing was even investigated. Indeed, it seems barely an eyelid was batted. If we stick to F1 analogies a couple of incidents spring to mind, and still don't offer many clues as to the justification for the rather pious reaction to Crashgate and the severe penalties handed down. 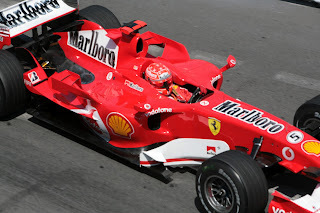 One of the incidents is that in the final moments on the Monaco Grand Prix qualifying session in 2006 Michael Schumacher, at the top of the times but not improving his time on his final run, deliberately 'parked' his Ferrari at the Rascasse corner in order to impede others from improving their marks. OK, as far as we can tell Schumacher's actions were not pre-meditated, instead appeared to be done in a panic, but in other ways it was worse than what happened in Singapore, with his car and attendant marshals much more 'in the line of fire' than Piquet's car was. And in this case it happened right at the end of a qualifying session remember, when most drivers will have been at the limit, determined to improve their lap times. Whatever the case it's hard to see what the grounds are for the only punishment in the Monaco case being Schumi being dropped to the back of the grid for the next day's race, while Briatore and Symonds were banned from the sport for what appeared a similar offence in Singapore. And lest we forget that the team principal in the Monaco case is now FIA President. And there is also the famous occasion at Suzuka 1990 when Ayrton Senna deliberately drove into Alain Prost's Ferrari at the first corner, and at high speed, to the end of settling that year's drivers' world championship in his favour (and a year later admitted as much). That act was just as pre-planned as 'Crashgate', and worse happened at much higher speed and with much greater danger to all involved. Aside from the two drivers and cars who made contact there were 24 others close behind, as well as thousands of spectators just the other side of the fence. Yet Senna was never punished for his actions. 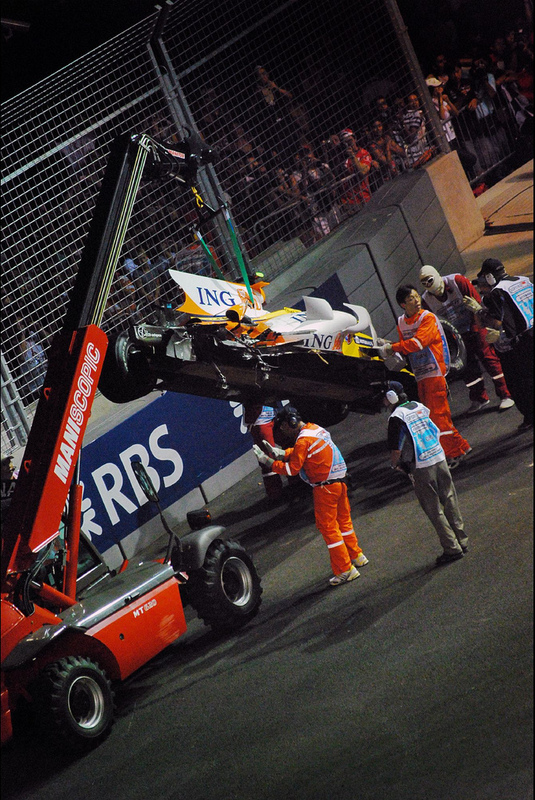 Much of the ire in response to the Crashgate case has been justified by the perceived risk to Piquet, other drivers, spectators and marshals from the accident. As outlined, the two incidents above seemed much more acute in that regard, and without wishing to sound complacent about what is still a dangerous sport I feel that the talk of potential danger in the Singapore incident is over-stated. In modern F1 cars and on modern F1 circuits in that particular crash it would in all likelihood have taken a chain reaction of absolute freakishness for any driver or spectator to be endangered. The additional danger over and above the risks in any F1 race was minuscule. Further, calling Crashgate a 'race fix', as many have, is also inappropriate in my view as a race fix would surely have involved other teams, and pre-arrangement of the whole (or a lot of the) final race result. Instead, I saw Crashgate at Singapore as little more than a crude attempt by Renault to take advantage of an imperfect rule that existed in F1 at the time (i.e. the closure of the pit lane at the start of a safety car period, giving massive advantage to those who had already pitted). F1's equivalent of the professional foul in football, to use a rough analogy. This is F1 remember; almost no one's hands are clean. Everyone pushes the boundaries, and even sometimes take a liberal view of where the boundaries should be - what happened in Singapore is that Renault got caught wandering on the wrong side of the line. As I said it deserved punishment, but I'm really struggling to understand the pass-the-smelling-salts reaction that many have undertaken. Eddie Irvine, typically blunt, summed it up: 'This [Singapore incident] is probably slightly on the wrong side of the cheating thing but in days past every team have done whatever they could to win – cheat, bend the rules, break the rules, sabotage opponents'. It is indeed difficult to understand why Crashgate 'blew up as it did', particularly by the standards of similar cases before. However, the capacity F1 has for intricate sub-plots and power politics is almost without limit, and it might be there that we find some of our explanation. If you're being really cynical you'd perhaps suggest that the then FIA President Max Mosley had been at loggerheads with Briatore for some time, most recently on the proposed FOTA breakaway, and thus just might have been more minded than usual to have Briatore's head on a spike before he left the stage himself. Still, what's done cannot be undone, and that goes for Symonds, Briatore, Piquet and the FIA. I for one will be glad to see Pat Symonds back where he belongs, on an F1 pitwall, next March. If 'Crashgate' punishment was an over-reaction, what was $100M fine? Good article and I share your view, one Team will but that bit better in 2013 with Pat S on board. Great post Graham, and I'll be pleased to See Pat S back too. But I do think your comparison with the Olympic cycling is inappropriate. There are parallels, but nothing Hindes did could have caused serious physical harm to him or anyone else. The Piquet crash may have been less dangerous than others manufactured in F1, but there was still a chance of serious injury and that's what makes it stand apart. This is specially so if Piquet was "ordered" to do it, as the FIA found. ie, those making the decision were not putting themselves in harm's way, a feature which also sets this apart from Prost/Senna. Anyhow, suspect your aim was to provoke, so Job Done! and thanks for the post. Thanks very much Evan for your compliments, very glad you like the post. On the Olympics cycling point it's true that there is much less of a risk element with bicycles than with racing cars, but then again if the 'sanctity of the sport' is the primary objection in the Crashgate case, as it has been for many people, then there's almost no difference between the Hindes and Piquet cases that I can see. On the Prost/Senna point, yes one of the worst elements of the Crashgate case is that Briatore and Symonds one way or another imposed a risk of physical harm on others that they were not facing themselves, but a distinction on that basis only works to a small extent if comparing with the Senna/Prost case at Suzuka. Yes, Senna was in a position to choose whether to put himself in harm's way, but crucially Prost, who he crashed into and put into harm's way, did *not* get this choice. Neither did the drivers of the 24 cars behind Senna. So in that sense Senna arbitrarily placed others in harm's way without their consent just as Briatore/Symonds did. 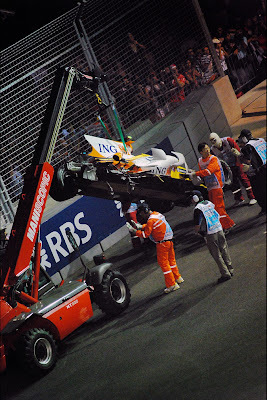 And let's not also forget that whatever the 'order' in Singapore, it was nevertheless Piquet who took the decision ultimately to crash his car deliberately. I can also honestly say that it wasn't my aim as such to provoke in writing this article (though I always knew it was a divisive issue). My aim instead was merely to give my views on this particular subject. To write simply to provoke is absolutely not what I'm trying to achieve on this blog. On 'sanctity of the sport' I think there was then enough latitude in the cycling rules (around when restarts would be allowed) to confuse the Hindes situation, so I still see it as distinct from deliberate crashes in F1, even if we don't consider the differing degrees of potential harm. However, it is a pretty fine distinction further eroded by Hindes apparently admitting to doing it on purpose and then apparently being ordered to change his story. And the mainstream press certainly did not cover this in the same way they would have approached a comparable F1 or a football story. I was in the Velodrome that day and there was at least one other restart from another team. I can't recall the details, and as a cycling naif I found it all quite hard to follow, but I believe one consequence is that the 'restart rules' will be reviewed and tightened. And naif or not, it was brilliant sport performed in a great arena with an astonishing atmosphere. My ambition for the Olympics was to go to one event in the Olympic Park with my wife and teenage sons and we finally got lucky in the 3rd round applications. Happy family lifetime memories!